Persimmon House is situated at a residential area. It is in safe and quiet place but convenient for transportation from Incheon Airport and Gimpo Airport and to the City Center-like Myungdong in less than 10 mins, Dongdaemoon 10 mins. And there is local market street nearby, so you can walk around and try real Korean dish in cheap price and feel how Koreans living! Also there is fashion mall and 3 big supermarkets so that you can get anything from there including souveniers. 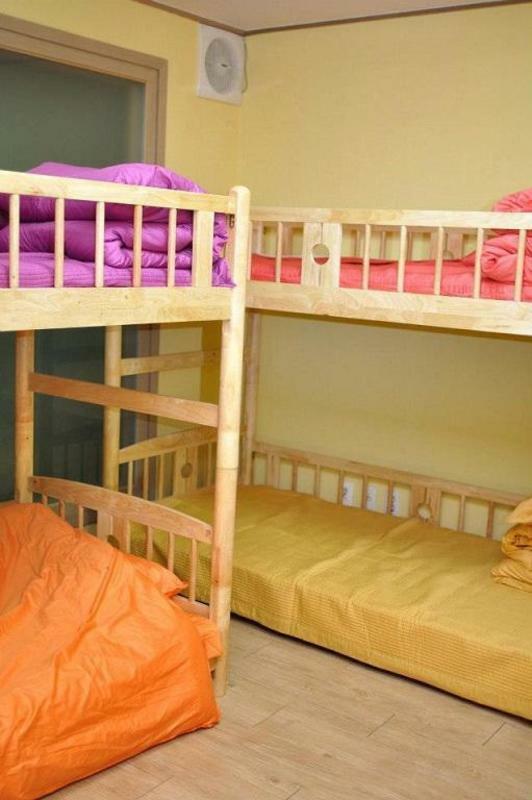 The hostel is very cozy , safe and comfortable place for reasonable price. and owner speaks fluent in English and Japanese. It is dormitory for B&B users having 3 bulk beds in one room and sharing in living room with folks from all over the world! That will be unforgettable memory staying @ Persimmon House! At the Heangdang Station, out of Gate No. 2, walk straight 150m, and turn left at Clock and Jewerly shop and walk to the hill for about 100m then you will find Persimmon House!